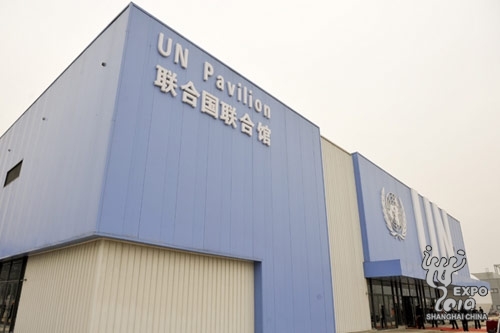 UN Pavilion covers an area of 3,000 square meters and is located at Zone B of the Expo Site. The main theme of the pavilion is “One Earth, One UN”. The pavilion would showcase UN and its agencies’ best practices in promoting world peace and development as well as meeting the challenges and opportunities of urbanization. Visitors will also learn how the UN is tackling climate change and promoting the concept of sustainable development throughout the world. Yesterday the Bureau of Shanghai World Expo Coordination and the UN have held a Pavilion Key Handover Ceremony at the 2010 World Expo site. Interior decoration of the 3,000 square meter UN pavilion will soon be under way. Thirty-three international organizations and institutions will take part at the UN pavilion. Construction for the Private Enterprise Pavilion was also completed this week. Decoration of that building will also take place soon. This entry was posted on Monday, January 25th, 2010 at 10:20 am	and is filed under International Participants' Pavilion, Pavilion. You can follow any responses to this entry through the RSS 2.0 feed. Both comments and pings are currently closed.